In April 2017, two conferences were held in Lyon and Paris, France, by BOBST & Partners, which focused on the latest innovations and solutions for flexographic printing and converting technologies for the production of high performance flexible packaging and labels. The Lyon event was marked by a presentation of BOBST given by Mr Jean-Pascal Bobst, CEO of Bobst Group. In his address, Mr Bobst took the audience through the Group transformation programme, which was implemented in 2010 and has four pillars including operational excellence, growth, effective organization and people and has been instrumental in BOBST achieving its targets of profitability improvement, value creation and strong business results. Mr Bobst also spoke about the Group’s four values of trust, respect, passion and performance, which are shared throughout the Group, and are at the core of its pride and confidence in the future. Mr Jean-Pierre Bonnet, President of the French Flexographic Technical Association (ATF), also addressed the audience in Lyon. He highlighted the history and mission of the association and brought to the fore the needs and trends of the packaging market through his many years of experience in the industry. 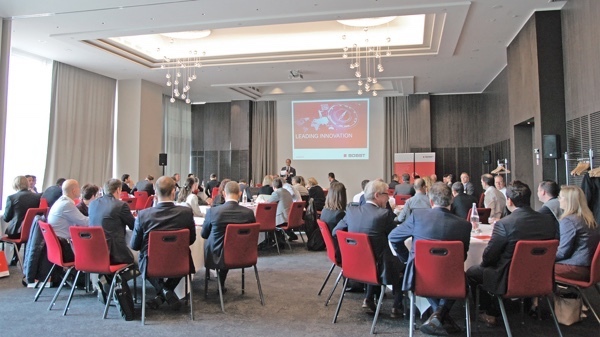 Technical presentations by BOBST and industry partners Borealis, DuPont, Esko, Henkel, Jindal Films, Siegwerk and X-rite PANTONE highlighted innovative machinery, equipment and consumables that can add real value to packaging production. They also highlighted the extent and importance of collaboration to address and answer the challenges of flexible packaging production and performance. “The roadshow is focused first and foremost on the benefits that users can derive from the latest technologies” explained Eric Pavone, Business Development Director BOBST Business Unit Web-fed “Together with our industry partners, we present an overall view of productivity-enhancing opportunities along the value chain and show how the latest technological breakthroughs can be turned into actual business gains”. BOBST flexographic printing solution presentations covered both Central Impression and inline equipment. For CI flexo presses it focused on technical capabilities, taking the audience first through the challenges of both the market and the process and then step-by-step how these can be met to achieve the best quality and profitability results. Uniting the entire workflow through centralized standards and fully digitized operations is a reality for the BOBST range of narrow- and mid-web inline UV flexo presses, through unique Digital Flexo automation. 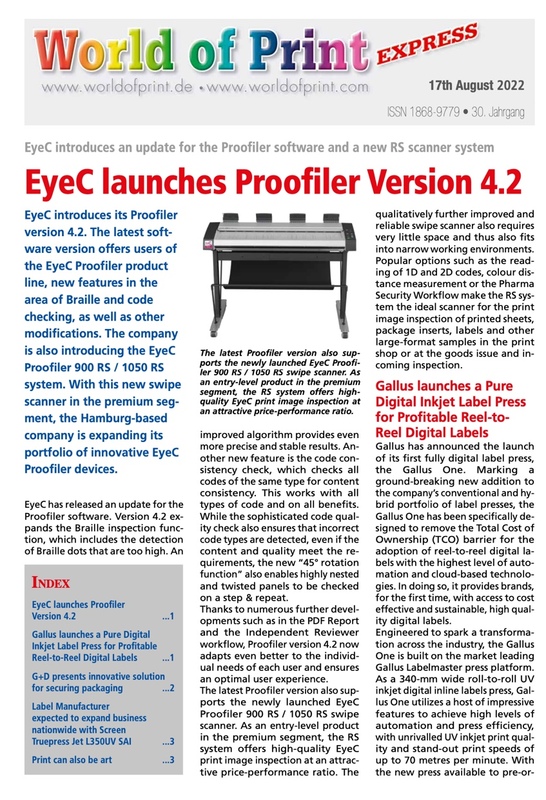 This was presented alongside the advantages of inline flexo and all-in-one-pass multi-process printing and converting. The best in class performance of the BOBST new compact laminators platform, the CL 750 multi-technology and SL 750 solventless laminators, were also presented to the audience, before tackling the topical subject of substrate functionality and sustainability. “We are strongly committed to partnering with key suppliers in the development of high barrier packaging substrates and their sustainability” said Eric Pavone “We work closely with film producers in our Competence Centers so that our machines can efficiently handle their substrates’ structural innovations and we are ourselves strong innovators in this field. BOBST is unique in the vacuum metallizing industry as a supplier who helps customers to optimize their processes for their specific requirements”. In this respect the presentation of Dr Carolin Struller, research scientist at Bobst Manchester, provided an insightful view of the clear barrier coatings market size, growth drivers and potential; in addition to AlOx barrier performance and latest AlOx conversion processes. Supported by a host of detailed information on test trials and laboratory analyses in a variety of applications, Dr Struller illustrated an AlOx film conversion process which incorporates the application of an off-line topcoat, to prevent barrier performance loss, during even the most demanding packaging applications. BOBST key competences in coating, featuring examples of both the latest trends in applications, such as clear on clear labels, and the latest developments in hot melt coating, up to 350°C drying tunnel and pressurized doctor blade, completed the BOBST technology update.